At the end of August hundreds of people from across the globe descend on the small town of Llanwrtyd Wells in Wales for the annual Bog Snorkelling Championships. This hilarious event is now in its 32nd year with many participants even donning fancy dress for their snorkel! However, if you don’t fancy taking the plunge there are loads of other things to do on the day including food and drink stalls, a bouncy castle and live music. Held in Dorking at the beginning of March, wife carrying returned to British shores in 2008 after an absence of nearly 900 years. Whilst it might sound a bit of a laugh, it is actually tough going with a distance of 380 metres to be covered going both up and down hill and featuring a water hazard! It can be dangerous stuff but the rewards are great – all entrants win a mini-keg of beer and a t-shirt! For fans of River Cottage and Hugh Fearnley-Whittingstall, nettle eating will be familiar as it featured on the TV show several years ago. Held at The Bottle Inn in Dorset, the event originated in the late 1980s with the competitors plucking and eating the leaves of stinging nettles. The most recent winner actually managed to stuff himself with a staggering 76 metres of nettle. Mmmm, delicious! 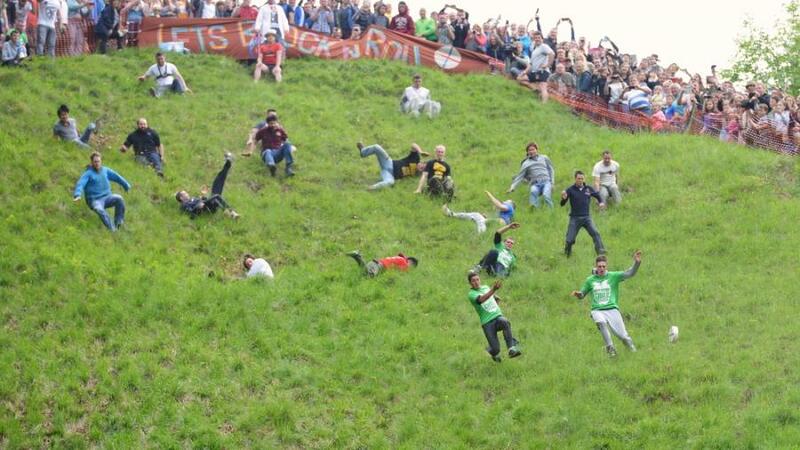 On the last Monday in May, the annual Cheese-Rolling Festival takes place at Cooper’s Hill in Gloucestershire. The event is unofficially organised by the villagers of Brockworth but people come from all over the world to take part. A 9lb round of Double Gloucester cheese is rolled from the top of the hill and competitors race down the hill after it, with the first person over the finish line winning the cheese. These days, due to health and safety concerns, the cheese is actually a foam replica but that’s kind of irrelevant as it is still a lot of fun! Another Gloucestershire event (must be something in the water!) which takes place in Bourton-on-the-Water in May, is Football in the River. This event, which has been going for over one hundred years, sees two local teams play a 30 minute football match in the River Windrush with a fete taking place beforehand. It is hugely popular but be warned, spectators can get seriously wet. However, it is enormous fun! Thanks to the wonderful stories by AA Milne, the World Poohsticks Championships is now an annual event held in Witney in Oxfordshire in June. The event is great fun for all ages with both experts and beginners all being encouraged to join in on the day. You don’t need to register until the day so why not turn up and have a go! At the beginning of July, sheep and lambs take over the High Street in Skipton, Yorkshire for a race to celebrate the town’s farming heritage. The annual Sheep Day has loads of other quirky events taking place including sheepdog duck-herding, cow-milking and a display and parade of vintage tractors. Sounds baaaaaarmy! There really is something for everyone taking place across the UK this year (even pea shooting and worm taming!) so head out there and have fun!